GSTR 1 excel master sheet made by CS K K Agrawal shall help you instantly generate b2b, b2cl and b2cs sheet without making any error. Very useful for those who cannot afford expensive software which cost in thousands. Small businessman, courier services, agents, service provider, Chartered Accountants, Company Secretaries, Traders, whole sellers, distributors, manufacturers, merchants, consultants, accountants etc. 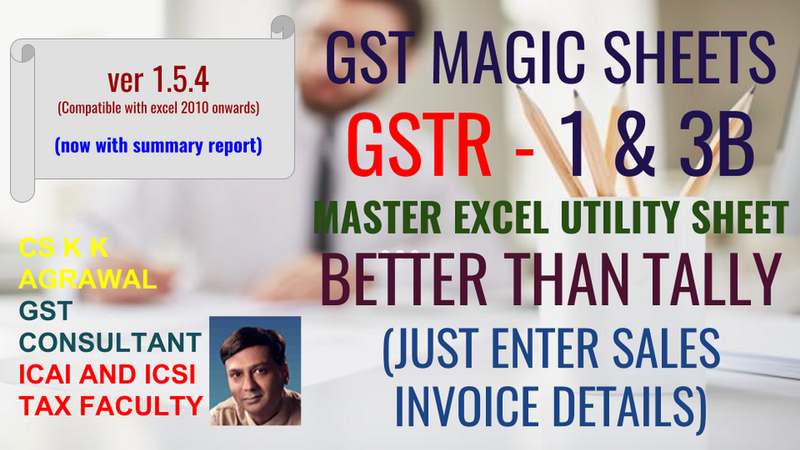 Also extremely useful for accountants and GST Practitioners who wish to provide error free services to their clients. As the saying goes "KNOWLEDGE EMPOWERS AND IS KEY TO SUCCESS"
All the copyrights of this form is with CS K K Agrawal. Anyone found distributing this form to anyone or uploading on any other platform is prohibited. No part of this content can be copied. If any one found doing this strict legal action shall be taken. This form is for personal use only. The education video in relation to this form is uploaded in youtube. Please watch it before this form is used. Our products and services are provided to the best of our ability and based on the present GST law. Any opinion, statement, recommendation or anything whatsoever shall not form a guarantee. Whilst we can advise you but it is your responsibility to ensure that products and services meet your particular needs. We shall not be held liable to and shall not accept any liability, obligation or responsibility whatsoever for any loss or damage arising from the use of this product. The author of book is CS K K Agrawal who is faculty of Direct Tax and GST having 15+ experience in teaching. He is visiting faculty at ICAI and ICSI. 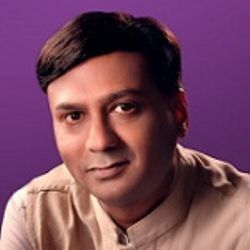 His online classes are available at taxbykk.com He is also author of "India&apos;s No. 1 book on Tax"
His writing and teaching is evolved in this quote “YOUR EDUCATION IN TAX IS BEST IF YOU CAN GIVE TAX ADVICE”. The tax advise is possible only when you are able to understand in-depth knowledge of tax in both theory and practicals. He has been encouragaging students to think creatively and apply their mind so that they can create their own sets of problems and their solutions. This type of understanding has encouraged many students to go further explore the depth of the subject. Least to say all the premier institutes says the following : “Taxation is one of the core competence areas of CA. CA’s are expected to ADVISE clients in the area of direct taxes and GST. My favourite quote is "NEVER SAY DIE". This never fail can be felt in books and videos both.